Planning a tour to anywhere is not an easy task but it is part of the fun. When I finish a tour this is when I start planning my next tour. Israel is a small country but never the less lots of traffic. Star tours, staying in one place and go out for daily tours are not recommended though it is possible. For example a daily tour to Galilee can be 6 hours driving go and come if you stay in Galilee at the end of the day you save 3 hours of driving. Ben Gurion international airport is the only airport we have in Israel, it is located on WHY 1 15 miles from Tel Aviv and 30 miles from Jerusalem. Tel Aviv is a good idea for the first stop as it is close to the airport. Tel Aviv is famous for its 24/7 life, beautiful sandy beaches, lots of restaurant. Hall of Independence and Old Jaffa are must visit sites, we have many other sites depends in you time. Petra Jordan is a possibility if you have 10 days or more to visit Israel, it is possible to visit Petra as well. in this case it will be highly recommended for you to fly back home from Amman, you might save up to a day doing it. The border crossing take time and are located far a way. The best is a circle tour. MOTI WAS THE BEST TOUR GUIDE OUT OF ANY TOUR GUIDE I HAVE HAD ANYWHERE AROUND THE WORLD. I am only 13 but moti helped me learn everything there is to know about Israel and helped me for my bar mitzvah service. We were a group of about 10 and he handled everything and everyone perfectly. It was a perfect mix of learning and plain fun. We, my daughter and I followed a friend’s recommendation to tour Israel with Moti. The trip was great, well planned and well orchestrated. We visited Jerusalem, Judea desert and we ended at the dead sea. The trip, as I mentioned, was a great experience and also educational, interesting and a great adventure. It will be remembered by us forever. Thank you Moti. Keep up the good work. Our family just returned from Israel having spent 8 days with Moti. The trip was fantastic, thanks to Moti. We are 10 people, 6 adults and 4 children (ages 8-13). Moti is extremely knowledgeable and lots of fun to be with. He planned the days so that they were very interesting and entertaining. The kids had a blast – he took them jeeping, hiking and camel riding. We also did some archeology. The trip was flawless. Moti created and executed a most memorable trip for all of us.If you have any questions, contact me. Thank you for giving us a lovely day today. You ‘read’ our situation very well and adapted accordingly. 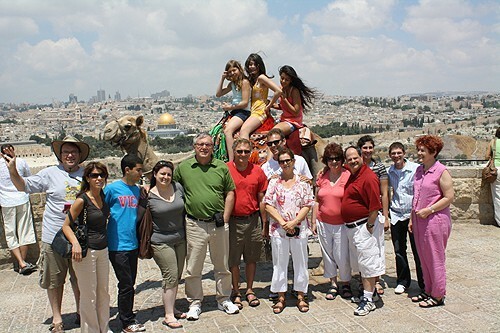 We had a great overview of the old city and the visit to the desert was another wonderful memory. Our readings about Israel will be so much more meaningful since your history lesson and your own life experience added immensely. I hope your optimism for eventual peace in Israel will be rewarded…..Canada is rooting for you! Thank you again for your understanding of our situation. I only wish we could have taken greater advantage of your expertise. We would like to thank you for your time and effort to educate us about Israel. We appreciated your passion, your knowledge, your humor and your care about us with your endless supply of water and the comfort of your mighty Jeep. especially for our girls to hear your personal story and how it related to the history of our people and Israel. We hope to see you again when we travel to Israel. If you ever visit Portland again, you are welcome to stay in your house. We want to thank you for our marvelous visit to Petra Jordan. You did all your possible for us , we were very pleased. Next time I have friends who are coming to visit Israel or jordan I will recommend you. Hello my friend! I wanted to take the time to say thank you for your wonderful tours! I truly was amazed at all the beauty that Israel had to offer. And the history was ascinating! You gave me views that I will always remember! I can’t wait to return to see more! I was sad to leave and am already eager to return! You have an amazing gift Moti! You are an incredible tour guide and have a beautiful soul as well! Thank you for everything you did for me in showing me the wonderful land of Israel! If you ever need a testimonial for your business or website let me know! I have only amazing things to say about you and what you do! You made my trip the best trip I have ever taken! Thank you! Again, thank you for everything! It meant a lot to me! We wanted to let you know how amazing our trip to Israel was; the best part was that you made it so good. You are an amazing guide who brought the country to life for us. We have been looking at our pictures and reliving the wonderful time we spent with you. You went above and beyond the duties of guide and became a friend. You especially did more than anyone would ask in regard to Stuart and his wheelchair!! If we return to Israel, we will call on you again to show us more of the county. I know we only saw a small part of it in the limited time we had. We will be posting recommendations for you on Cruise Critic and Trip Advisor, and also giving your name to a friend who may be visiting next year. Our rabbi’s Yom Kippur sermon this year was all about Israel and was so moving we are waiting to get a copy to forward to you to read. Also, we will forward some pictures as well when we get them sorted out. My grandchildren, twins, age 13 and I returned from an eight day private tour in Israel with Moti, January 3, 2010. I found Moti’s site on the Internet among countless others. How fortunate for us that I chose him. He is a remarkable individual and an outstanding tour guide. His expert knowledge of Israeli and Middle East history, religion, politics and culture coupled with is tireless passion, and energy for sharing his country with us, was contagious. While we had an agreed upon daily itinerary, he always managed to surprise us with an unexpected delight. His off road sites such as The Burma Road, and The Cranes of Hula Valley were visits that most tourists never get to see. His fun loving humor and his stories kept us laughing throughout the day. His concern for our needs and safety were ever present. The children summed up their daily experiences with exclamations of “amazing” from one and “I can’t find the words to describe….” from the other. I shared their excitement and joy; and, I was struck by his intuitive ability to capture their interest on a level they could understand while always addressing my own interests, as well. I recommend Moti for individual travelers and families, alike. Moti enhanced our love and understanding of Israel. Our trip with him was more than we ever expected and it will be a wonderful lifetime memory. We are home now; and, Moti continues to be a gift that keeps on giving! We wanted to let you know how amazing our trip to Israelwas; the best part was that you made it so good. You are an amazing guide who brought the country to life for us. We have been looking at our pictures and reliving the wonderful time we spent with you. You went above and beyond the duties of guide and became a friend. You especially did more than anyone would ask in regard to Stuart and his wheelchair!! If we return to Israel, we will call on you again to show us more of the county. I know we only saw a small part of it in the limited time we had. Our rabbi’s Yom Kippur sermon this year was all aboutIsraeland was so moving we are waiting to get a copy to forward to you to read. Also, we will forward some pictures as well when we get them sorted out. “You are a fantasic guide, and made Israel by far our favorite stop” Hello Motti! Shalom! We are back from our vacation, and I just wanted to e-mail you to let you know how much we appreceiated our day with you in Israel! You are a fantastic guide, and made Israel by far our favorite stop on our cruise. With three children, I was not sure what to expect, but you had so much enthusiasm for them the entire day, that they will remember Jersuselum in such a special way ALWAYS! We learned so much in one day, and you shared so much knowledge. I knew instantly that it was going to be a great day when we began our “off road” tour and saw the shepard in the street with his sheep. Truly, we are so grateful for our day with you, and after talking to many people on the ship feel so priviliged to have had the private tour, because we were able to see SO much more than most people. We proudly have our new nativity seen in our home that we will treasure always. The spice for the Jeruselum Bagel made it home safely too, so we will have memories of the Jaffa Gate Bagel for quite a while :-). It was a fantastic day, and if you ever come to Germany or later (after we move back) to the U.S., know that you always have a place to come visit. Thank you so much! Today marks one week since we returned to the states. While this was my ’Chai’ [18th] visit to Israel, I can honestly say this was, by far, the most enjoyable. You, and your Land Rover, made it an adventure, with surprises around every corner. From eating, multiple times, in Abu Gosh, offroading on the beach, driving the ’Burma Road’ to drive where I would never consider taking my car, Sheila & I couldn’t have had a better experience. Your knowledge of ’everything’, your passion for Israel. your willingness to push us to make changes in our itinerary [you were so right], and your personality made this a trip we won’t forget soon. God must have been looking out for me a woman traveling alone to Israel for the very first time – when he sent me Moti Barness as a guide. With Moti you get the equivalent of a college course on the Middle East… with laughs! Israel is his home and he welcomes you as a host would a long lost family member. He made this trip a life changing experience. Thinking of hiring Moti as a guide? You should be so lucky! We finally got back to Sydney just over a week ago now after a truly wonderful trip. Thank you so much for helping make the Israeli and Jordanian part so memorable. We enjoyed it immensely and meeting you and touring with you made it better than we ever expected. The rest of the trip was also wonderful but not having Moti with us to explain and test us and prepare us to “ATTACK” meant it wasn’t quite the same …. Moti was absolutely wonderful. We came across his name via the internet after interviewed at least 4 guides via Skype tobe sure I could understand any accent. Moti was by far my favorite. Moti planned wonderful visit for us. I only wish we could have spent more time with him. Not only is he extremely knowledgeable, he is a colorful individual with his speech and sense of humor. He treated us with utmost respect and kindness. Moti made sure we had a truly memorable visit. Being a tour guide is not just a job to Moti. Showing off his homeland is his passion. In addition, he took us to some very interesting places in his Land Rover that a number of tourists do not normally get to see. My husband and I highly recommend Moti Barness. You can’t go wrong. All our best. Wishing you and your family a healthy, peaceful new year. This letter will not adequately convey how much we enjoyed your guide service. You truly made our trip to Jerusalem unforgettable. We saw so much and learned so much – mostly attributed to your warm and inviting personality. Aside from your seemingly endless knowledge of Jerusalem’s history, we equally enjoyed your insightful and pragmatic point of view regarding the people and the conflicts you live with daily. And while lasting peace may not come soon, I believe people like you (individually) truly move the process one step closer each and every day. Thanks for enriching our lives and being such wonderful ambassador to your country. Each day was informative, fun and always an adventure. Thank you (and all your colleagues) for making our first trip to Israel so memorable. We will defiantly call you before we return again and pass your name to any of our friends that plan to travel here !!! Thank you for your guide in Old City Tour. Everyone enjoyed the tour even though we would never understand the complexity of religious struggle your people are facing. Good luck on your profession.